THE HAGUE, Netherlands -- The International Court of Justice on Wednesday rejected Ukraine's request for measures aimed at blocking Russian support for rebels in eastern Ukraine, saying Kiev did not provide enough evidence to back up its claim that Moscow sponsored terrorism by funding and arming the rebels. 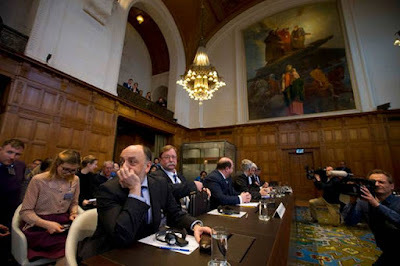 Roman Kolodkin, head of the legal department of the Russian Foreign Affairs ministry, center left, waits for the judges to enter the World Court which delivered its order on provisional measures in The Hague, Netherlands, Wednesday, April 19, 2017, in the case brought by the Ukraine against Russia accusing Moscow of financing separatist rebels and racially discriminating against ethnic Tartars and Ukrainians in the annexed Crimea peninsula. Ukraine had asked the court to order Russia to shore up its border and prevent weapons, vehicles, people and money reaching the rebels while the case is heard in full, but the court refused. However, in another element of Ukraine's legal case against Russia, the world court imposed measures to rein in discrimination by Moscow against ethnic Tatars and other minorities in Crimea. At hearings last month, Ukraine accused Russia of sponsoring terrorism by providing funds and weapons to rebels in Ukraine and of discriminating against Tatars and others in Crimea. The court took Ukraine's side on allegations of discrimination in Crimea. In a 13-3 decision by judges, the court said Russia "must refrain from maintaining or imposing limitations on the ability of the Crimean Tatar community to conserve its representative institutions." Russia last year banned the Mejlis of the Crimean Tatar People, the self-governing legislative body of the Crimean Tatars, calling it an extremist organization. On Wednesday, the U.N. court's judges also unanimously ordered Russia "to ensure the availability of education in the Ukrainian language" in Crimea, the Black Sea peninsula that Moscow annexed in March 2014, sparking international outrage. A separatist insurgency erupted in eastern Ukraine the following month, backed by Russia. The case in The Hague, which also seeks reparations for the 2014 downing of Malaysia Airlines Flight 17 over eastern Ukraine, adds a legal front to the bitter, drawn-out conflict. The U.N. court said it expects both Moscow and Kiev to work to implement the Minsk agreements that were designed to bring peace to conflict-ravaged eastern Ukraine. Wednesday's ruling is a preliminary decision aimed at preserving the rights Ukraine claims Russia is breaching while the full case makes its way through the court, a process likely to take years. In a legal victory for Ukraine, the 16-judge panel said that the court appears, at this early stage of proceedings, to have jurisdiction in both cases. "For us this decision of the court is a positive one," Ukrainian Deputy Foreign Minister Olena Zerkal said outside court. "We proved our position and we see that we have a very good perspective for the hearings on merits." The Russian delegation left court without commenting.